Brickstitch a brightly colored amulet bag and matching earrings. Bead this colorful bag from Beadcoop author Debbie Vasilinda. Brick stitch the body, whip stitch the edges, then add the fringe and strap. 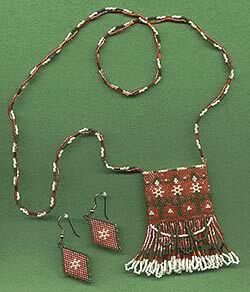 The pattern is included for both bag and earrings.